These days it seems like everyone knows the importance of project methodology. But it wasn’t always like that. I have been helping organisations with their project methodologies for over twenty years now. And in the early days it was much too common to hear PMs fighting against common process. Old hand PMs would often refer to project management as a black art. Viewing everything from their narrow perspective they would say processes hamstrung them and were bureaucratic. Actually to be fair I still pick up that view today from time to time. Although now perhaps it is more often an internal monologue as the jury seems to have come down fairly (and rightly) on the side of process. In maturity frameworks like P3M3, project methodology is a cornerstone capability. Having, and of course following, a project methodology provides such a good foundation for best practice. Most importantly it brings consistency to the actions and steps of the team. The shared understanding of the steps to be followed raises quality and reduces delays and costs. The use of common terms likewise makes for gains through all aspects of a project. Thus by having an appropriate method you also improve your risk and issue management, planning and other aspects. You can steadily evolve your method to give you the sort of changes which stick. The sensible organisations start light keeping the culture change impacts as low as possible. Once project teams accept the method you can then evolve it to gradually to include new elements. You can use a well tuned method to actually give flexibility. Even in the most routine of organisations a single one size fits all approach to project methodology rarely works. You can instead have a family of methods with a consistent set of core content. You can then adjust each method in the family to the needs of a particular type of project. If you can’t measure it you can’t manage it. Once you can see what project teams should be doing it is much easier to see who is failing and which teams need your help. I have now been working in this area for twenty years and with every new customer I learn something new. The landscape is constantly changing and evolving and will continue to do so. 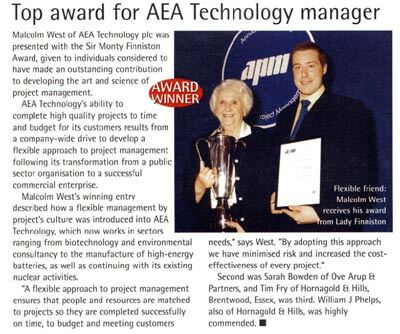 Early in my career I was working at AEA Technology not long after privatisation. I was the site engineer for a badly failed project which at the time felt terrible but which taught me so much. Over the next two years I was Secretary of an internal Project management task force. Working across the organisation we did lots to change the culture and improve the approach to projects. We took a different approach to PRINCE2, which was launched around this same time and developed a scaled method. Instead we had three types of projects with a shared core set of materials and an assessment checklist. We also developed a competence framework which showed expectations for the roles on each project type. Training and mentoring supported project teams in adoption, as did an on-line resource manual. Our work here was innovative at the time, although has since become quite the norm. The APM awarded me the Sir Monty Finniston award in 1999 for this work. At that time the award was given for ‘developing the art and science of project management’, it is now a lifetime achievement award. So when in 2005 we launched PROJECT in a box to help people use PRINCE2, it is no surprise we made the system flexible. This ability to support multiple methods has proven to be very popular with users. Some customers use our off the shelf pre-scaled nStep project methodology, which of course now boast 20 years of experience in their development. Other customers use the tools to host their own in-house methods or standards like PRINCE2 and Praxis. All customers however benefit from our experience, advice and help in this area. And you can too! Our free Community Edition tool provides a range of different Project methodologies that you can use free forever. You just need to sign up to try it for yourself.